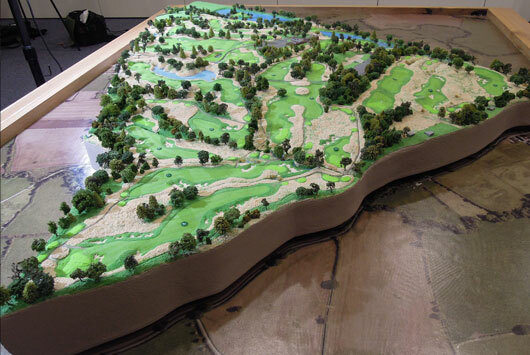 We have received many admiring comments about the clay model made of the new course we’re designing for JCB…and rightly so. It is a wonderful piece of craftsmanship. The man responsible for the model is Jeff Shuttleworth, from Bolton and he deserves all of the plaudits. The idea for the model came from JCB Chairman Lord Bamford. He’s not a fan of computer generated imagery and prefers the tactile, three dimensional qualities of a good model. 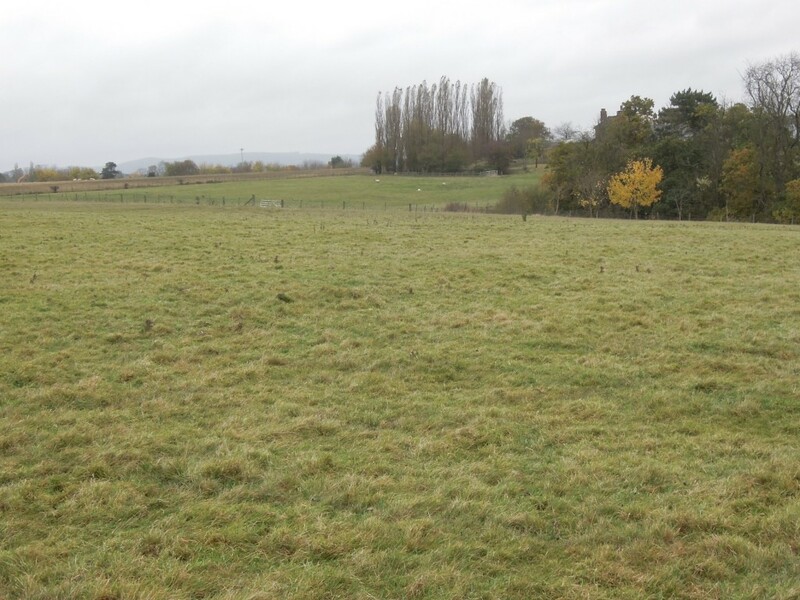 He felt that the golf course proposal could be more amply appreciated and understood if people were able to get up close to and walk around a large scale site model. He was proved to be right. EGD was asked to suggest a model maker and I immediately recalled this chap who had made a fantastic single-hole model for us back in the days when I used to work for Hawtree. This was nearly twenty years ago though and both his name and company details had long since escaped me. I turned to the one person who I thought may just remember him, my former design colleague, Mike Cox. Remarkably, Mike not only remembered him, but had done some work with him in recent years. The only problem was, as Mike told me, that Jeff had retired from professional model making several years ago. Nothing ventured, nothing gained, so I gave Jeff a call and left a message on his answer phone, explaining what we had in mind. Later that day, Jeff called back, sounding somewhat surprised and said that he’d be very keen to look at the job, but that he’d thrown away his model making tools, thinking he’d never be needing them again! Things move quickly and efficiently when you deal with JCB and shortly thereafter, Jeff was engaged to produce the model in time for a public exhibition and press launch in January 2014. This gave Jeff two months to complete a task that needed three! It also forced us to accelerate our design schedule, as Jeff’s model is scaled to our detailed 1:1000 plans, which weren’t due to be completed until Christmas 2013. Necessity is the mother of invention and to cut a long story short, we pumped out the design plans in double quick time and Jeff exceeded all expectations of him and delivered the completed model in good time, working 18-20 hours a day, all through December and the Christmas holidays. 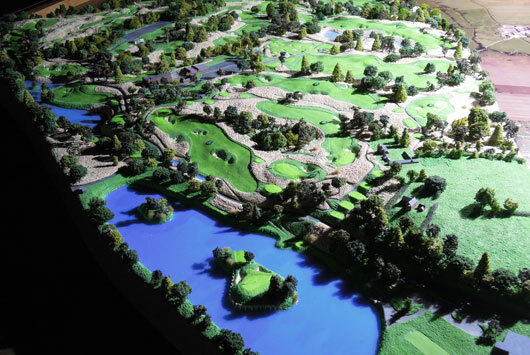 There was a palpable sense of excitement when the model was unveiled and it was, for me, immensely rewarding to see the design of our course so accurately portrayed. Jeff is very particular about how the model should be lit to accentuate the shadows and contours. Keep the lighting at a low angle and from one position only. In these conditions, the model springs to life, highlighting every bump and hollow. Jeff’s attention to detail is incredible and you can spend hours gazing over the model. It is quite mesmerising. It’s been a thrill to see the model take shape under Jeff’s skilled hand. He’s lost none of the magic and if there is any justice, he should find himself with a few more to do in the future. JCB are thrilled with his work and so are we. Photographs of the model have formed the centrepiece of the worldwide press coverage, explaining what the course will look like better than any computer rendering or sketch can do. 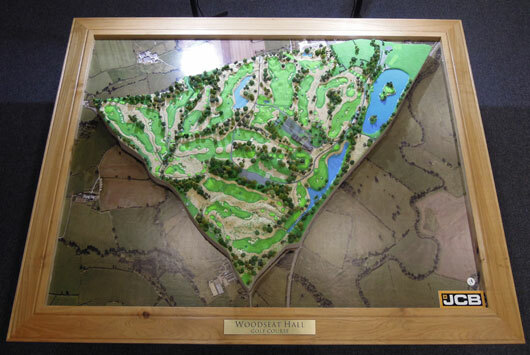 The model sits for now in the JCB executive offices, but in time it is envisaged that it will reside in the foyer of the new clubhouse at Woodseat Hall. 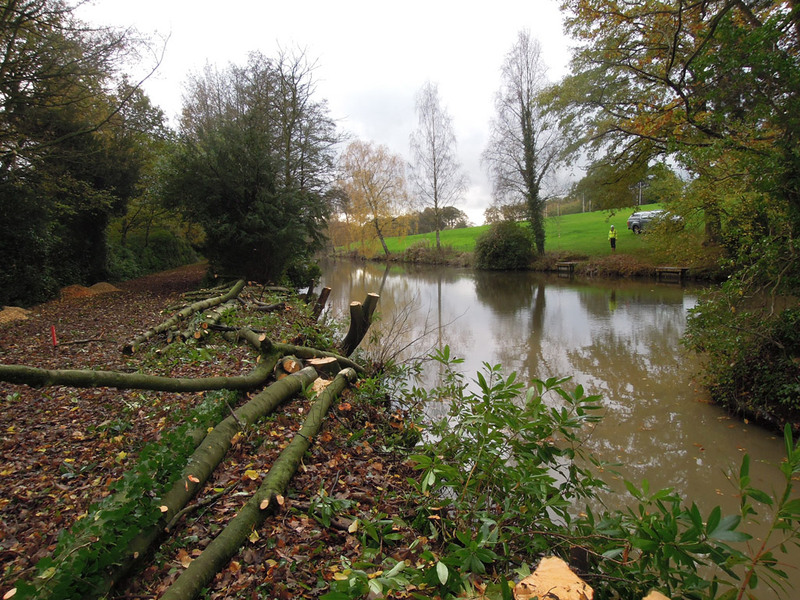 Hopefully, you might get to see it there, but for now, here are a few photos of Jeff’s fantastic work. In these harsh economic times it is nice to be able to report on a golf course opening, even if it is one with which we have not had a design involvement. 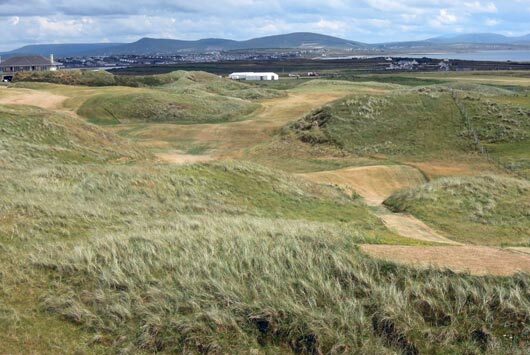 Such is the case with the unveiling of the new Kilmore 9 holes at Carne Golf Links in Belmullet, County Mayo, Ireland. I must declare a personal interest in the course, as I am an overseas life member of Belmullet Golf Club. 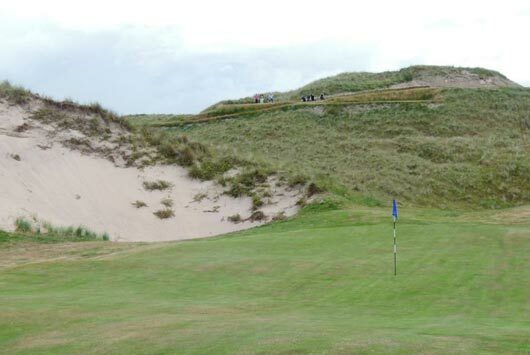 One of the key incentives for me joining was the prospect of this new 9 holes being developed through the most incredible dunes I have ever seen. I was shown a draft plan back in 2006, which had been prepared by one time EGD designer, Jim Engh. The course that has finally emerged some seven years later is much revised from this initial sketch and has, in the later stages of development, been spearheaded by a good friend of EGD, Mr. Ally McIntosh. Whilst Ally has fronted the design of the new course, it only exists because of the willpower and dedication of one man, Carne’s Eamon Mangan. Eamon was the inspiration and the driving force behind developing the new holes, despite Ireland’s crushing recession. 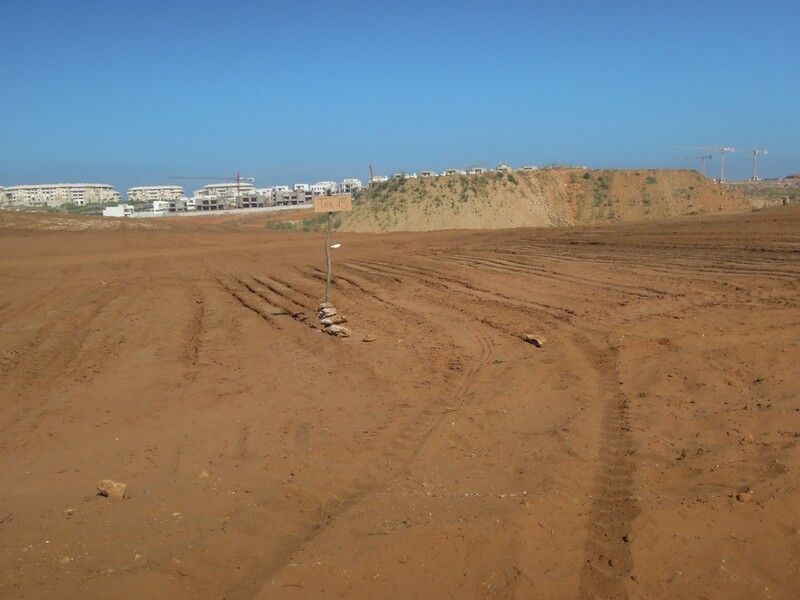 The holes have been built on the tightest of shoestring budgets, reportedly just €140,000. Work could only be carried out when there was money in the kitty to allow it, which meant that for long periods the fledgling links lay deserted. On more than one occasion I looked out over the new course and doubted that it would ever be finished, but with Eamon’s dedication and Ally’s design eye, the course was finally unveiled for play on Tuesday July 23 2013. The entire Carne development is a good news story. This is a modern links, dating only from the mid 90’s, developed by the community as a tourism incentive. It was the last course to be designed by the great Eddie Hackett, whose light touch has left in place some outlandish fairway contouring that other more heavy handed architects may have flattened in the pursuit of fairness. The story of how the course came to fruition is succinctly captured by Richard Phinney and Scott Whitley in their excellent book, ‘Links of Heaven’. How the locals rallied together at the eleventh hour to purchase the links from seventeen separate landowners, each with a government grant to fence in their strip of duneland with five rows of barbed wire, is a story of devout community spirit and foresight. 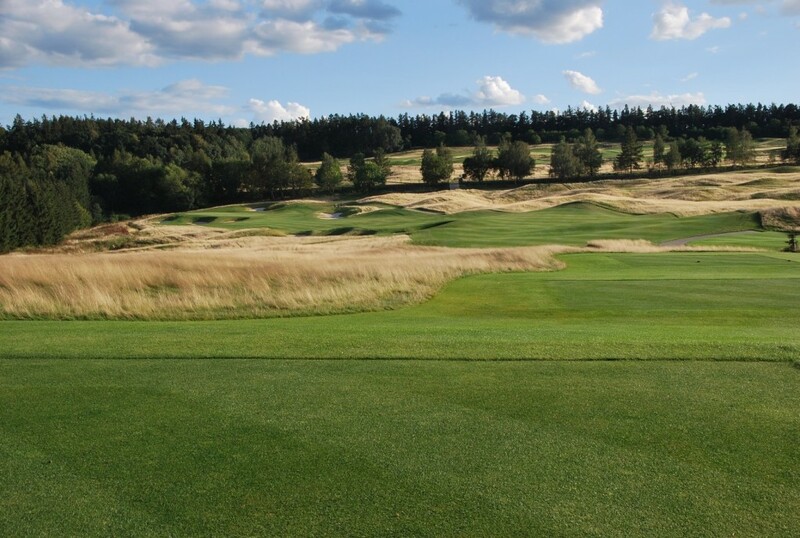 Their reward is a magnificent course, ranked consistently within the top 50 courses in Great Britain & Ireland. If ever a course was worthy of making a concerted effort to play, Carne is it. Nobody arrives in Belmullet by mistake and this amazing links at the very edge of the continent, makes the long, lonely drive across the dark peat moors of Mayo thoroughly worthwhile. 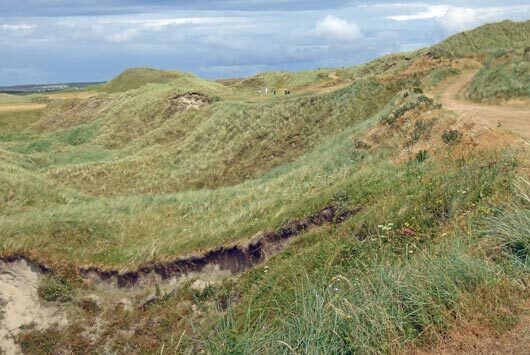 Carne now has twenty-seven of the most dramatic, natural duneland holes in the World. With such a minimal budget, the necessity was to use the lie of the land wherever possible and it is with great skill that the new 9 wends its way between and over dunes of epic proportions. It is thrilling golf, raw in form and with stern consequences for waywardness. The hand of man is evident only in the location of the few bunkers that punctuate the course and the sporty, turbulent green surfaces, that will be great fun to putt on once they have fully matured. One minute you are playing through narrow clefts between immense sand hills, fully 100-feet high. The next you have ascended to a pulpit tee, seemingly on the roof of the World, with incredible views across the dunes to Blacksod Bay, the Atlantic Ocean and the islands that pepper the horizon. Golf really can be this great. It is a lesson to all of us who design for a living. The course is still admittedly something of a rough cut. Given some maturity it will become a polished diamond and further cement Carne’s growing global reputation. Eamon, Ally and all at Carne should be immensely proud of their achievements. It is superb. Above: Second shot on this par 5 is played over giant dune above the flagstick! This was it. Death…or Glory. The final hole. The final approach shot. All that stood between me and victory was 120 yards of shimmering water, surrounding the pin prick sized island green. With a pounding heart and trembling hands, I made a slow backswing and with the sole thought of “don’t look up” on rapid repeat in my mind, I carefully transitioned into the downswing. Then….I looked up. Rather than striking into the meat of the ball, my club made contact close to the equator. An awful, thin sting reverberated up my arms and in an instant I knew I was doomed. Rather than prescribing a graceful arc against the cobalt blue skies, my ball speared furiously toward the engulfing waters. It smashed hard into the agua, disappearing for ever…or so I thought. So bad was the contact, that the ball was loaded with topspin and it instantly launched itself back into the air. One skim, two skims, three skims and then with one final, improbable salmon leap, the ball jumped up onto the green and ran out towards the flag. A miraculous escape and as I made my way around the lake shore to the green, victory and glory was assured. At least that is what I saw in my mind’s eye. 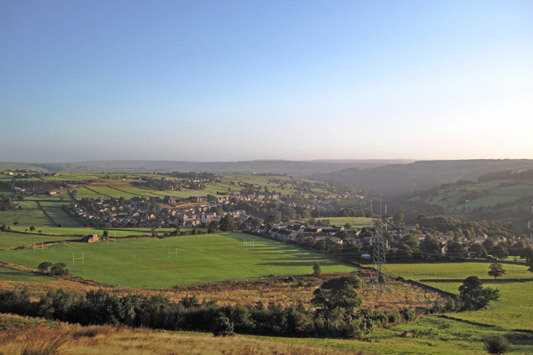 What any casual observer wandering across the windswept pastures of Rishworth School playing fields, high in the Pennine Hills would have seen is a solitary, mop headed 10-year old kid skulling a greying Penfold Commando across the outfield of a cricket pitch towards the roped off square, with a cut down, hickory shafted 7-iron. All that broke the silence in the lowering gloom was the constant fizz and crackle from the high voltage cables hanging from the twin lines of National Grid pylons that marched across the high moors in a mournful metallic parade and the far away drone of a farmer harvesting silage. And that is how this career in golf course design started for me back in the late 70’s. Often on my own, or with my elder brother Andy, we would head up to the enormous playing field and make up imaginary golf holes from the bleak expanses. Teeing off we might hit over the rugby posts, before skirting around the (imaginary) fierce rough of the hockey pitch and over the (thankfully literal) sandy hazard of the long jump pit before reaching the eventual target of the cricket pitch roller. And so it went on with many hours passed blissfully in this picturesque dreamscape. I could never have known then that because of these mindful distractions that a lifetime of…frustrating golfing mediocrity would ensue. I should have been doing what our Andy was concentrating on, which was getting better at golf! But it proved to be the genesis of a career. Something snagged in my brain that making up golf holes would be a fun thing to do, yet without a thought as to how one actually went about it. Besides, at that age I still had more pressing ambitions about being either the next Niki Lauda, Glenn Hoddle, or Ian Botham (depending upon the season). Ranking right up there with equivalent rarities such as witnessing a solar eclipse, the aurora borealis, or an England penalty shoot out victory, the staff of EGD, or myself, Ross and Gary to be precise, managed to all be in the same place at the same time and with the required spousal permission to convene for a twilight golf match. 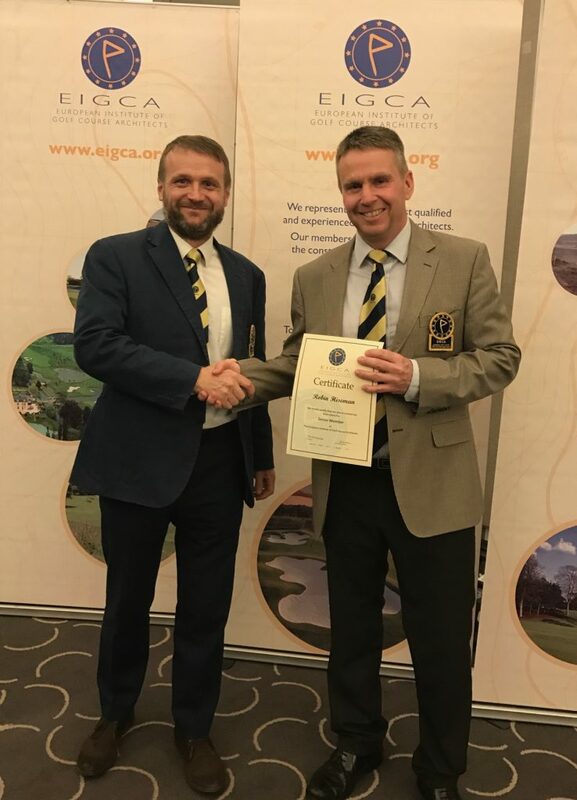 Having been spurned by a well-to-do, hilly heathland course, who decreed that our £140 was of no value to them on a quiet Monday evening, we plumped instead for the welcoming embrace of the lovely North Hants Golf Club, in Fleet, Hampshire. If I had a home club, this would be it, as I live just a couple of miles away. 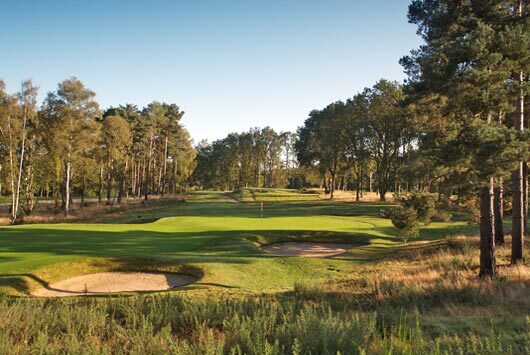 Unfortunately, such inconveniences as joining fees, membership subscriptions and parental duties come between me and my rightful place strolling the turf of this beautiful heathland course. North Hants is the real ‘sleeper’ amongst the Heathland belt courses, but it has a high caliber design pedigree with Braid, Colt and Simpson all having significant hands in its development. 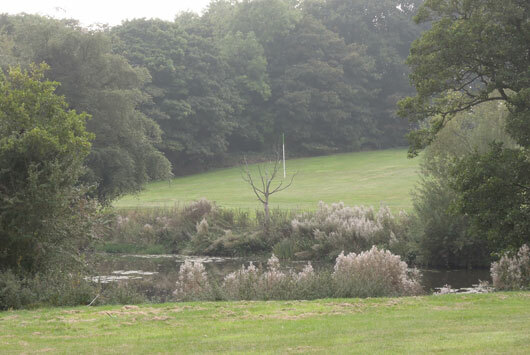 In more recent times, Donald Steel’s office designed some new holes, including the excellent par 5 3rd, which plays over a lake that was previously hidden within the undergrowth. 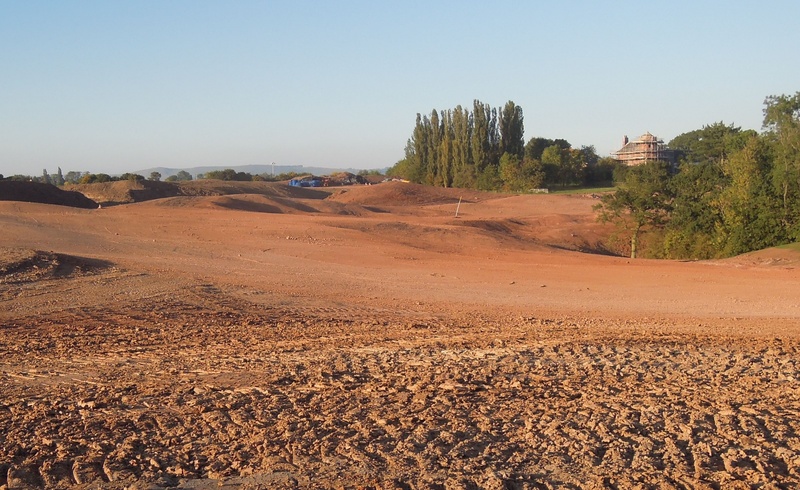 Over the past few years, the club has been undertaking an extensive tree removal and heather regeneration programme, which combined with a bunker remodelling scheme meant that the course was presented to us in tip-top condition. It’s the course where Justin Rose honed his game as a boy and where he was still a junior member when he had his unforgettable run at the Open Championship at Birkdale. 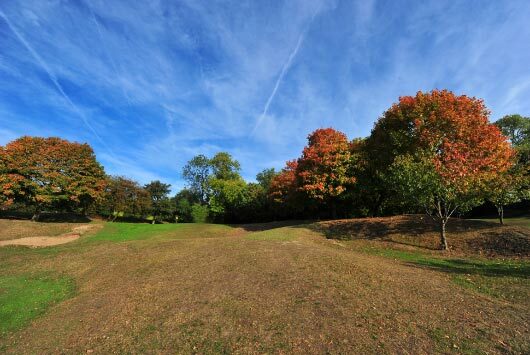 It’s well worth a look, with strategically placed bunkering and large, undulating greens. Ross said that it was definitely the best course he has played this year. High praise indeed from our Ryder Cup designer, only marginally diminished when he confessed that it was also the only course he has played this year! And so to the golf. High stakes Skins was the order of the day. They say you should only play for what you can afford to lose, so it was 25p per player per hole for the first six, 50p for the second six and a whopping £1 a hole for the final six. All told, one could stand to lose up to £10.50 if everything went against you. Now, one of the vagaries of the Skins format is that it is often the case that the best player doesn’t win and so it proved as Gary came out as the victor…well, if you can’t be good, be lucky they say. Both Ross and I grinned through gritted teeth as Gary tramlined a putt of fully 60 feet across the 18th green (our 9th) to take the pot. To be fair, the boy played good, as this was also his first round of the year. He’d be dangerous if he played a bit more. For the record, Gary scooped 10 skins and £21.75. I came second with 4 skins and £6.75 and Ross third with 4 skins and £3. With the light fading and the money exchanged, Gary drove off into the twilight with heavy pockets and the certain knowledge that his loving fiancé had his dinner on the table when he got home. Ross and I left with a lighter load and the equal certainty that our spouses would not be catering for us this evening. It is for such times that the chip shop comes into its own. Above: 8th Hole – North Hants Golf Club. Article first appeared in Golf Course Architecture magazine issue 27 (Jan2012) by editor Adam Lawrence. 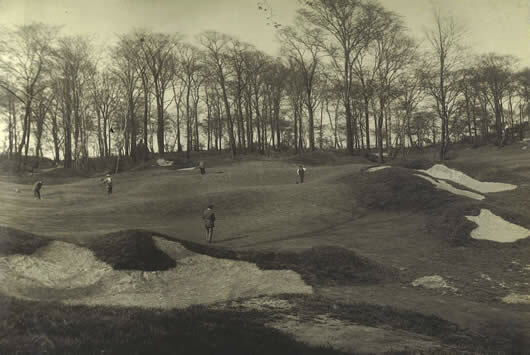 Alister MacKenzie’s extraordinary par three twelfth at Sitwell Park, near Rotherham, South Yorkshire is arguably the most iconic ‘lost hole’. Except this is a lost hole with a difference. It is still there, sort of! It remains 140 yards long, just as MacKenzie planned, but MacKenzie’s extravagant green is long gone, replaced by a humble design that gives no hint that this was once a green of such repute and controversy, that it influenced the evolution of golf course architecture. MacKenzie’s work for Sitwell Park was completed in 1913, early in his design career. 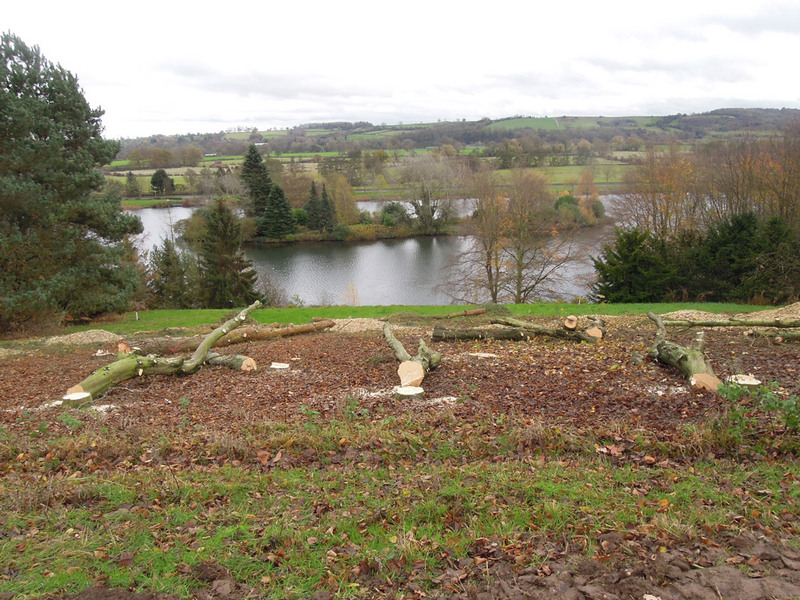 The site was notable for a very steep, wooded hillside upon which the clubhouse was to be built. 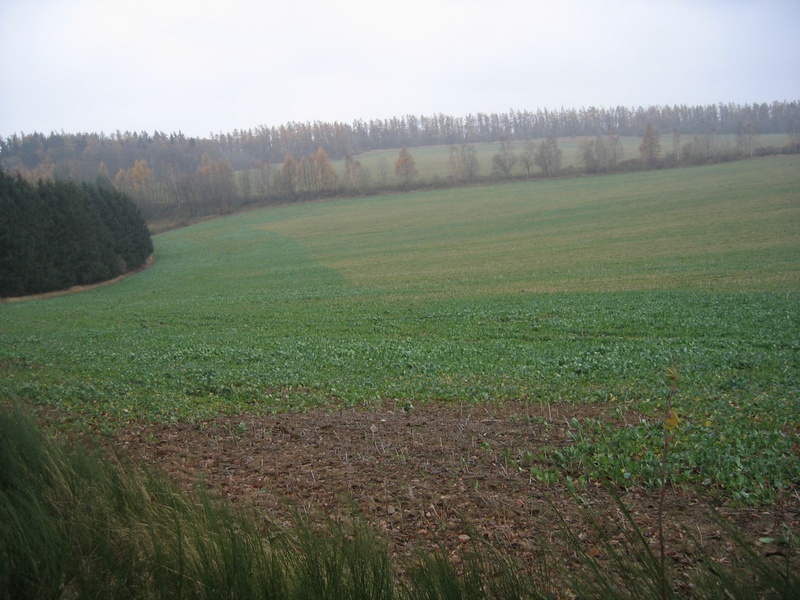 MacKenzie’s routing required that two greens, the twelfth and eighteenth, be sited adjacently, high upon this hillside and approached from below. The accepted wisdom would have been to form a basic cut and fill green terrace. MacKenzie knew that to do this would result in each green being sited high above the eye line, with a tremendously steep embankment fronting each green. The putting surfaces would certainly be hidden and this was not acceptable. Instead, he built a pair of wildly undulating, eccentric greens that tumbled down the hillside close to the existing gradient. Each green contained numerous small cut and fill terraces to create flatter areas, but woe betide the golfer who left their approach shot above the hole location! We’ll focus on the twelfth hole, as this is the green made famous by the iconic photograph, but the eighteenth was so similar in form that ever since it has been mistaken for its nearby twin. MacKenzie’s twelfth green was an artistic triumph. He executed a construction that allowed the golfer a clear view of the putting surface and which amply rewarded an accurate approach shot. It looked magnificent and fitted seamlessly into the precipitous hillside. It was also a functional disaster, as for anything other than a precise approach, the fierce contours would repel the ball to points from which the club golfer would have a miserable time recovering. Golfers were embarrassed. And they hated it. MacKenzie was infuriated by this criticism and fired off a vigorous and eloquent defence of his design. “I have got accustomed to measuring the ultimate popularity of a hole or course by the amount of criticism it gives rise to in the first instance,” he wrote. “It is only natural that players who have been spoon fed on insipid, flat uninteresting golf should view with a considerable amount of suspicion anything which is undoubtedly out of the ordinary. One cannot contradict MacKenzie’s opinion that accurate approach play deserves reward. However, in my view, MacKenzie was guilty of perfecting the form at the expense of the function. Even with greens mown with primitive technology, balls were running out of control. MacKenzie defied his doubters, but he couldn’t defy gravity and the twelfth green was doomed from the outset. History shows that this gentleman didn’t need to issue an apology. Apparently, the course was subsequently played by a number of prominent professionals, who roundly criticised the greens as unfair. The club committee capitulated and MacKenzie’s incredible greens were radically flattened and contracted. What emerged were the simple platforms that MacKenzie so strenuously avoided. MacKenzie’s pride was wounded and he later delivered a stinging rebuke to the club committee for making the course ‘dull and insipid’. And that was that. They were gone. Consigned to history, but not forgotten, thanks to the photographer who took the historic snapshot. Initially printed in MacKenzie’s book Golf Architecture, this photograph has been the staple diet of golf design books ever since and continues to amaze to this day. 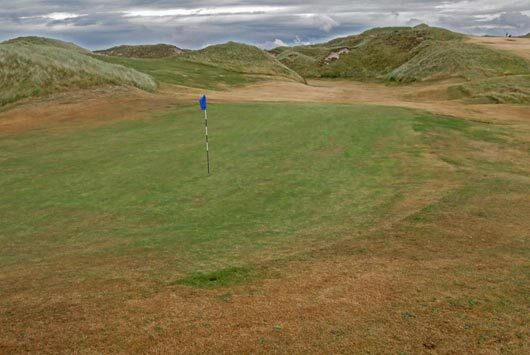 Some have tried to replicate the green, perhaps most notably in modern times, Tom Doak and Brian Schneider, with their ‘Sitwell’ green at Barnbougle Dunes. One would be a fool to attempt an accurate replication, as modern green speeds would preclude you from finding even one sensible hole location on a green like this. 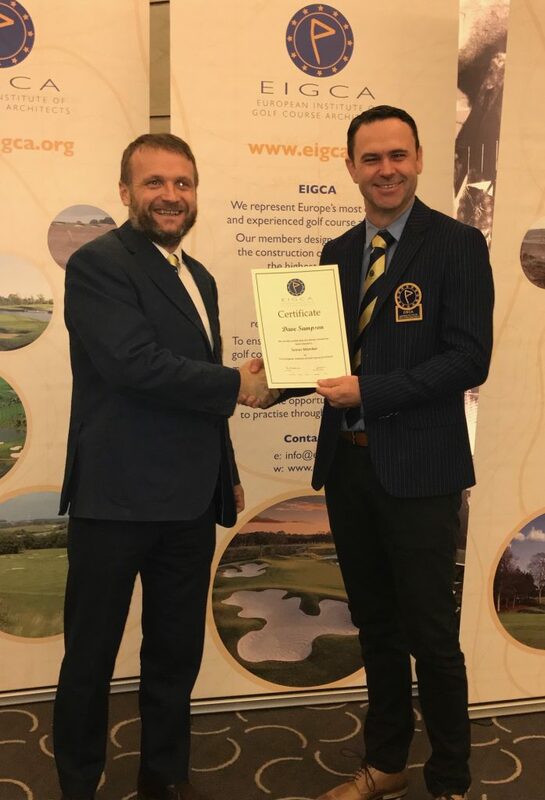 Robin Hiseman is a golf course architect with European Golf Design, and responsible for the design of the Royal Golf Club, Bahrain, in association with Colin Montgomerie, Casa Serena in the Czech Republic and the future Club de Campo Tres Cantos, which was Spain’s proposed venue for the 2018 Ryder Cup. Above:The short lived green is still the most spectacular putting surface ever built. Above: Many of MacKenzie’s ridges and terraces are still apparent in Sept 2011. 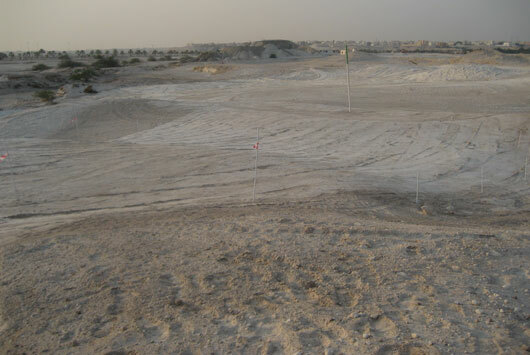 Here is a before and after shot from the par 4, 6th hole at The Royal Golf Club, Riffa Views. 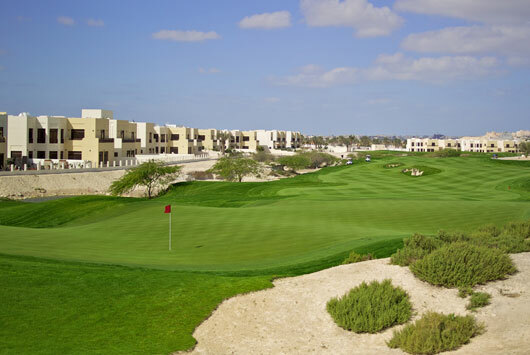 We worked with Colin Montgomerie at Riffa Views and the course opened at the end of 2008. It’s a links style golf experience in the desert, with fast running fairways and open approaches into huge, firm contoured greens. 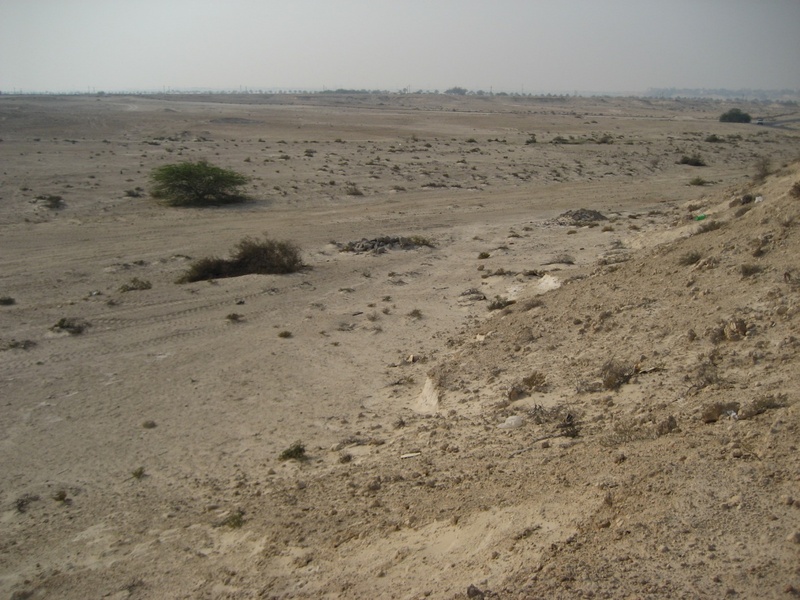 Above: Here is the 6th hole as it looks today. 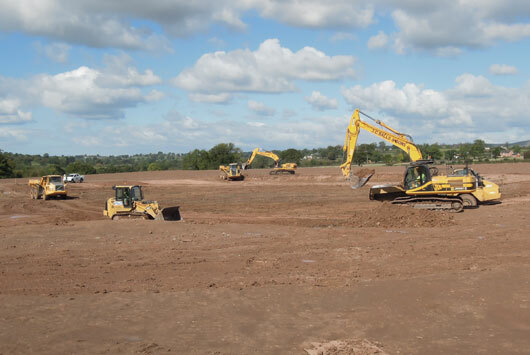 Above: Here is the 6th hole during construction in 2007.